The college-opportunity gap widens whenever a student from a low-income background does not go to college or falls short of finishing a degree. While many scholars agree the problem exists, there is also a research gap as to the causes and solutions. 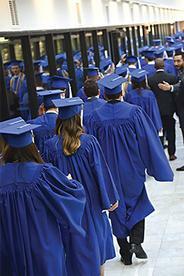 American University’s new Center for Postsecondary Readiness and Success aims to close both gaps by partnering with high school counselors, postsecondary experts, and scholars around the nation to produce pioneering new research on ways to make higher education more available to underserved populations. Housed in the School of Education (SOE), the center is the first of its kind to critically examine school counseling systems, college advising practices, systemic inequities, and other patterns that work against students from low-income backgrounds, new-majority and first-generation students, and students of color. Part of the solution involves training more high school counselors, says Laura Owen, the center’s inaugural director. The national ratio of students to counselors is 482 to 1, according to the National Association for College Admission Counseling and the American School Counselor Association. Both organizations recommend a ratio of 250 to 1—a goal so far achieved only in the less populated states of New Hampshire, Vermont, and Wyoming. In addition to seeking better training for career guidance advisors and stronger financial aid support, the center helps students better prepare for college by texting them timely information as they need it. The UpNext texting program sends messages about everything from preparing for the SATs and ACTs to applying for financial aid. Through partnerships, the center is bringing messaging support to 3,500 rising DC college freshmen and 1,500 rising DC college sophomores. All this research comes at a time when the number of young Americans who receive more education than their parents lags behind the numbers in many other countries. Owen and SOE dean Cheryl Holcomb-McCoy have done extensive work addressing systemic college-opportunity challenges. Since launching the center, they have assembled an advisory board of more than 20 national experts from multiple fields. They bring concrete ideas for improving the odds of low-income, first-generation, and new-majority students getting into—and finishing—degree programs at two- and four-year institutions. Guided by these education scholars, practitioners, and leaders, the center is looking at models of student support, such as school counseling and postsecondary advising, with the aim of introducing new frameworks for postsecondary success. The center has defined its core goals: One is to identify common practitioner competencies that give students good postsecondary guidance. Another is to reimagine, reframe, and conduct interdisciplinary research on effective practices to support equitable student postsecondary exploration and planning. Also on the agenda is to provide practitioners, families, and students with user-friendly reports containing information they need to improve postsecondary success. In the long term, it is about giving students tools and practices that can be replicated throughout US schools. The center has already received three grants totaling more than $400,000 from Civic Nation, the Kresge Foundation, and Raise DC. Owen and Holcomb-McCoy also are involved in the Reach Higher Initiative spearheaded by former first lady Michelle Obama. Its goal is to help students around the country continue their education beyond high school, whether through professional training programs, community colleges, or institutions offering four-year degrees.